Connecticut’s Beardsley Zoo hosts several events throughout the year reaching an audience of hundreds of local residents. Support the Zoo & promote your business to your target audience at the same time! For more information on sponsoring any of our events, please contact Amanda Bolanos at abolanos@beardsleyzoo.org or 203-394-6574. Our most popular event brings in over 1,200 guests who taste more than 60 wines, beers & cordials, as well as samples of food from several area restaurants. This event also features live entertainment and a large silent auction. Benefits may include recognition on our website, invitation (distribution 4,000+), eNewsletter & Facebook page. Click here to see a recent sponsorship form. Gather three coworkers, friends or family members and join us at the exclusive Connecticut Golf Club in Easton for fun and fundraising! With a course rating of 73.5 and slope rating of 136 on Bent grass, this course will challenge and exhilirate even a seasoned golfer. Includes a round of golf, contests (hole in one/closest to the pin/straightest drive), company promotion on our website, eNewsletter & Facebook page and great food! Each golfer receives a goody bag as well as a Connecticut’s Beardsley Zoo golf shirt. Click here to view a sample registration form. Looking for a ‘not-so-scary’ sponsorship opportunity? 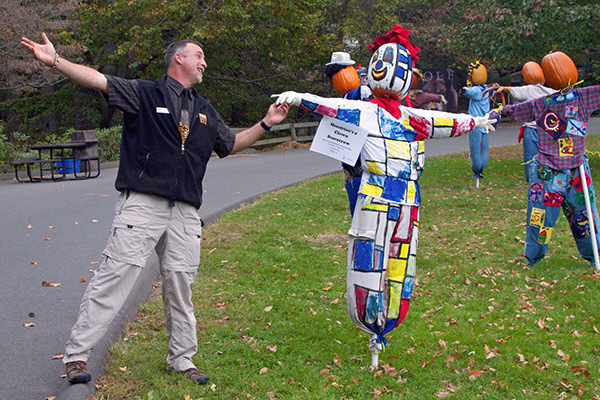 Support youth, arts and the environment by becoming a Zoo Scarecrow Sponsor. Your $250 Scarecrow Sponsorship provides the materials necessary for a local school or art program to deisgn and enter a scarecrow into the Zoo’s Annual Scarecrow Competition. Scarecrows are displayed on Zoo grounds for a minimum of one week with prominent sponsor signage. Your benefits include recognition in signage, in our eNewsletter & social media, and two family-four packs of admission tickets to the Zoo.